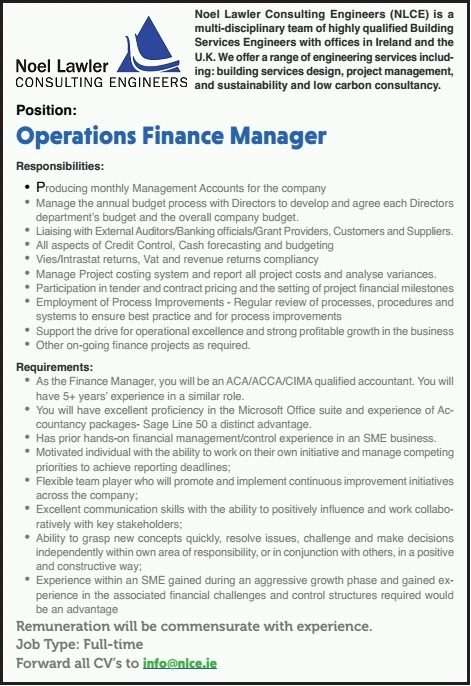 A top Kilkenny engineering firm is recruiting an Operations Finance Manager. Noel Lawler Consulting Engineers (NLCE) is a multi-disciplinary team of highly qualified Building Services Engineers with offices in Ireland and the UK. They offer a range of engineering services including: building services design, project management, and sustainability and low carbon consultancy. Manage the annual budget process with Directors to develop and agree each Directors department's budget and the overall company budget. Liaising with External Auditors/Banking officials/Grant Providers, Customers and Suppliers. Manage Project costing system and report all project costs and analyse variances. Other on-going finance projects as required. As the Finance Manager, you will be an ACA/ACCA/CIMA qualified accountant. You will have 5+ years' experience in a similar role. You will have excellent proficiency in the Microsoft Office suite and experience of Accountancy packages- Sage Line 50 a distinct advantage. Has prior hands-on financial management/control experience in an SME business.